A nice draw with a long iron or a fairway wood from the tee will leave you a short iron into this undulating green. A long drive that cuts the corner might be rewarded but is not of importance as a deep bunker guards the right of the green. Risk or reward. 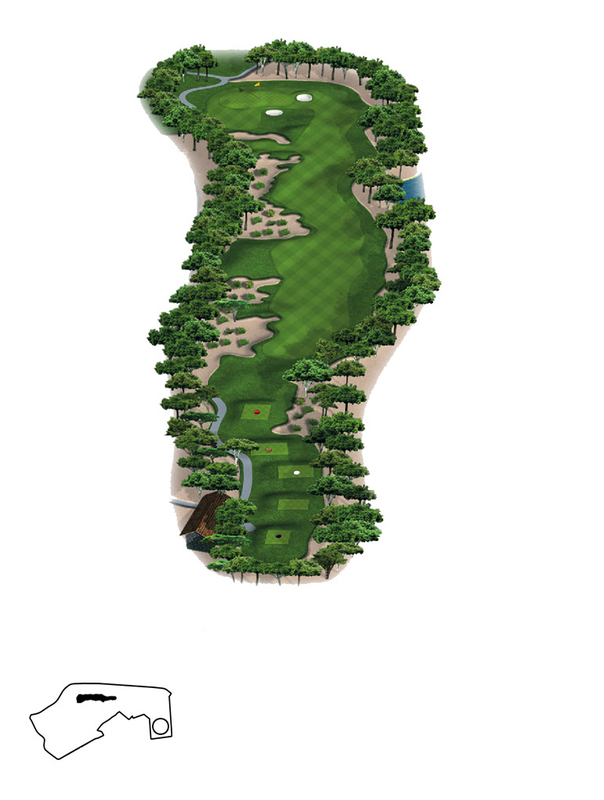 With a long accurate tee shot you might get a chance to reach this par 5 in two. For the more conservative player, the third shot over the water must be well judged as the correct distance is vital. Water, water... A long accurate tee shot is required on this mentally challenging par 3. Take plenty of club to carry the lake to a generous green. A fade is the best shot from the tee. A tough stretch of par 4s awaits. Make sure to find the fairway as water lurks on the left. The undulating fairway will give you plenty to think about for your long approach to the green. Another good drive is required to carry the water. Aim right for the shortest route over the water, but aim left to give yourself the best approach shot into this well-defended, raised green. A relaxing stroll through the villas has given you the time to refocus. A well placed drive leaves you with an easier angle. into this green protected by the lake in front. Be careful not to go through the green, as a bunker shot back across the green would be testing to say the least. A beautiful little par 4 starts the second nine. A strategic tee shot avoids the waste areas and leaves you with a good view of the green. When judging your second shot remember that you are playing downhill. A relatively strong par 5 through the pine trees. You need to be both long and accurate as the lines of trees are thick and will penalise the wild shot. Line your tee shot up on the almost unreachable central bunkerfor the best view for your second shot. A raised green will make your approach decisive. One of the toughest par 4s on the course and birdies will be rare. The hole is long and it might be wise to play it as a par 5. Don’t be fooled, the bunker on the left is well short of the green. Make up your mind, should you go left or right of the trees in the middle of the fairway? For the longer players a tee shot to the left leaves a view of the green round the corner. With a waste bunker splitting the fairway for your second shot this dog legged par 5 will test all your golfing skills. Make sure to take plenty of club here to clear the water. Think about the wind above the tree line as it might fool you standing on the tee.It takes a courageous mid-iron to find this green. It might be the shortest par 4 on the course but can still cause you lots of trouble. Stay away from the deep bunkers protecting the corner and be careful, this fairway gets narrower the longer you are off the tee. Take a moment to enjoy the fabulous view from this tee! The waste area in front of the green is reminiscent of the third hole at Pine Valley, one of Colin's favourite golf courses. The imaginative shape of this green offers numerous interesting hole locations. This tee shot is made for Monty's fade. The waste bunker on the right will catch a sliced drive, and the high pine positioned at the front right corner of the green will make you favour the left side entrance to this generous green which is full of slopes. A long and challenging par 5 through a wide fairway divided by big waste areas will take you home to the magnificent clubhouse. Keep your concentration and you might pick up a finishing birdie if you can successfully avoid the deep bunkers on the left.